I had in mind for my fourth viewing of the film to finally watch the five hour television version. When I had at last set aside an appropriate chunk of time, I found that my copy has the English subtitles appearing over the burned-in German subtitles. It was distracting and hard to read, so I quickly gave up and put in the old DVD of the theatrical version. Which is perhaps just as well, because my one big complaint about this film is that it does feel a bit long. Even the (Palme d’Or-winning) theatrical cut weighs in at nearly three hours. That’s a long time for such a manic film. While every scene has its charms, some are superfluous and repetitive in the grand scheme of things. It’s for this reason that I’ll be knocking this one off my top 100 in the next revision. I need to make room for Girl Walk // All Day anyway, and besides, Kusturica is already represented by the wonderful Time of the Gypsies (a movie I anticipate remaining on my list for many years to come). Making lists is an insane process, involving far too much hand-wringing and hair-splitting than the end result merits (how much does anyone really care about someone else’s favorite movies?) so maybe next time I’ll take a more devil-may-care approach. All of this is poor prelude to what should be the heart of this review, which is: I love this film, overlong though it may be. 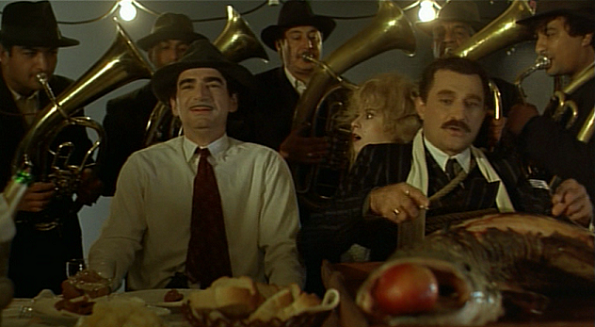 Kusturica takes slapstick to dizzying heights, framing it in a world that’s perpetually falling to pieces. Chaos is the norm, with fights breaking out and chimps driving tanks, all while the brass band plays on (Goran Bregovic’s oompa score is infectious). Underneath the fun is tragic social commentary. You can blame the downfall of Yugoslavia on Nazis, or Russia, or Tito… but Kusturica also shakes his head at Yugoslavians themselves. Profiteering, deception, delusion, collusion, ignorance both willful and imposed. The citizens lived, like the residents of the underground shelter, in a world of their own design, either blind to or ignoring the reality until it was too late. This entry was posted on November 25, 2013 at 9:26 pm	and is filed under Movie Reviews. You can follow any responses to this entry through the RSS 2.0 feed. You can leave a response, or trackback from your own site.